The Salmson 2 was a French biplane reconnaissance aircraft made by Salmson. It was developed to a 1916 requirement. Along with the Breguet 14, it was the main reconnaissance aircraft in use with the French army in 1918. At the end of the First World War, one-third of French reconnaissance aircraft were Salmson 2s. 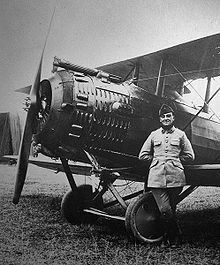 During the First World War, the Salmson factory built aircraft engines, generally 9- and later 18-cylinder water-cooled radial engines developed from the Swiss Canton-Unn� design. The company's first entry into aircraft design came with the Salmson-Moineau S.M. 1, an unusual three-seat reconnaissance biplane with twin airscrews gear-driven from a single Salmson engine in the nose of the fuselage. These aircraft, of which 155 were built, were not especially successful. The Salmson 2 developed from a requirement to replace the Sopwith 1� Strutter and Dorand A.R. reconnaissance aircraft in the A2 (tactical reconnaissance) role. Salmson had built the 1� Strutter under license, and the Salmson 2, while an original design, owed more to the Sopwith than to the earlier Salmson-Moineau. The aircraft was of conventional construction, powered by the company's own 9Z water-cooled radial engine of 230 bhp. Some minor control problems were quickly resolved in early testing, but the main defect of the Salmson 2, shared with the contemporary Airco DH.4, was that the pilot and gunner were seated rather far apart, making communication difficult. Production was ordered after trials on 29 April 1917, and deliveries were underway by October of that year. Around 3,200 Salmson 2s were built in France, 2,200 by Salmson and the remainder by the Lat�cox�re, Hanriot, and Desfontaines, companies. Some of these were Salmson 2 D2 dual control advanced training aircraft. Salmson 4, an enlarged version fitted with light armour, designed to meet the Ab 2 ground attack role. Limited production in 1918, but cancelled at the end of the war. Salmson 5, modified Salmson 2 for A2 role, no production. Salmson 7, modified Salmson 2 for A2 role. The main change was that the pilot and gunner were seated back-to-back in a single cockpit. Production was planned on a very large scale, but the end of the war resulted in cancellation of the contract. Salmson Limousine - After the First World War, a number of ex-military Salmson 2s were converted into civilian passenger aircraft. In addition to its service with the French army, the Salmson 2 served during the First World War with United States air units. Some 700 were purchased, and were generally successful. Post-war, Salmson 2s were purchased by Czechoslovakia, and remained in service until 1924. Others were transferred to Poland, but were withdrawn by 1920, and replaced by Bristol F.2Bs. Japan undertook license production as the "Army Type Otsu 1", also known as the Kawasaki-Salmson. The number of aircraft built in Japan is unclear: 300 were built by Kawasaki, and the same quantity by the Imperial Japanese Army's Tokorozawa supply depot, although the total number of aircraft produced may have been as high as 1,000. Salmson 2 Pictures and Salmson 2 for Sale.